You are on death row. There are up to four other players with you. Challenge: survive. The setting is Trailsend, Damara in the Forgotten Realms. Trailsend is a trading crossroads. Your character can be from anywhere, have done anything. Because of the scenario, this is for mature roleplayers only. Extensive DM notes included with the module, along with a player guide. This conversion of a classic pen-and-paper module by ENoa4 now has a DMFI Edition with enhancements for multiplayer and DM’d play. Base yourself at the Keep while exploring the wilderness beyond, including the Caves of Chaos. DM Guide, Player Guide, and other aids included. Swords & Sorcery is an old-school action/fantasy game, designed to be completed in a short, single play session and to be replayable. Players must make their way from the King’s Castle through the forest to rescue the kidnapped Princess from the Necromancer’s Tower. 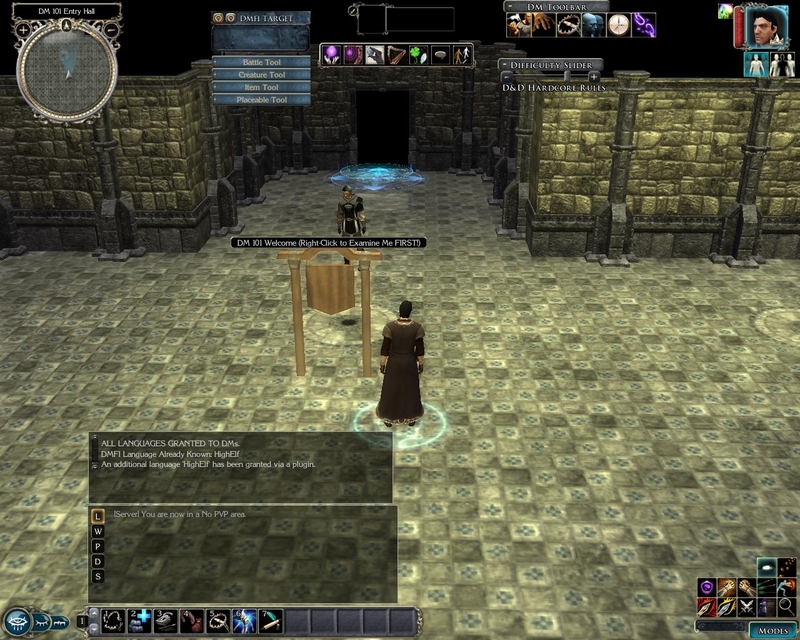 The module download package includes separate player and DM guides. DM 101 is an entertaining self-teach module designed to give you all of the skills necessary to become a NWN2 Dungeon Master. While it is primarily designed to teach basic DM skills, including use of the DMFI Tools, even experienced DMs may learn a new trick or two. The accompanying documentation walks you through all the necessary steps to create a DM avatar and start the game with the DM client, so no previous experience is necessary. Download package includes the tutorial module, DMFI Tools hak, installation instructions, and module documentation. The base mod includes as custom content (hak files with accompanying scripts) the DMFI Tools for NWN2 and Heed’s PC Tools, which are widely considered within the NWN2 community to be essential DM and player client enhancements. A few individual scripted DM tools are also included as well as some small but useful other community scripted content. The mod includes several easily selectable and extensible death, bleeding, respawn, and rest systems. All content is documented and appropriately credited in the included Builder’s Guide.